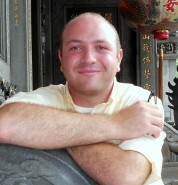 Ph.D. candidate in international relations at Georgetown University. 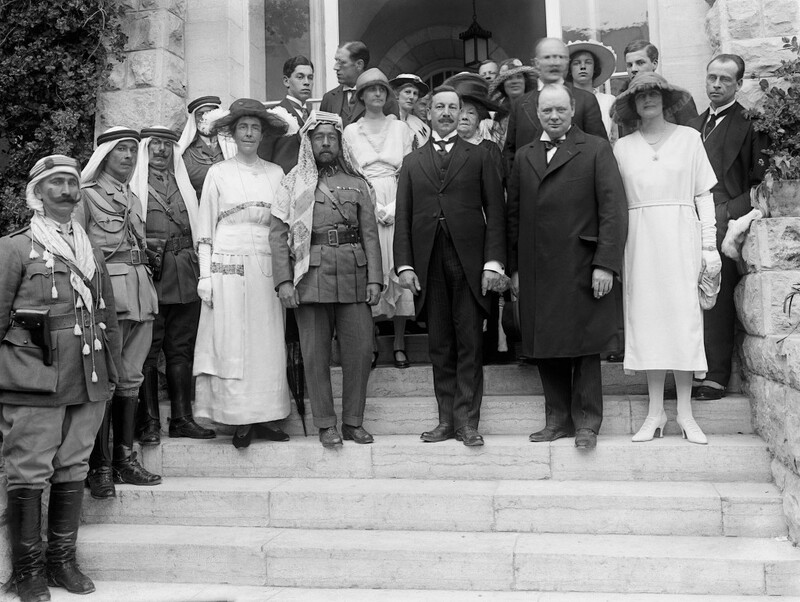 A century ago, European powers redrew the lines of the Levant according to their own needs. They are gone, but the map remains, along with a shameful irony: While Europeans found a better way to set their own borders, the states they carved out of the Ottoman Empire continue to burn and self-destruct. On March 6, 2011, fifteen Syrian fourth-graders in the southern border town of Daraa scribbled, “the people want to bring down the regime” on the walls of their school, echoing slogans shouted across the Arab world for two months. Like their brethren in Tunisia, Egypt, and Libya, the schoolchildren had a bleak but limited goal: To end the 43-year rule of the totalitarian Assad regime. Their graffiti was so threatening that the Daraa Fifteen, as they became known, were arrested, beaten, and denailed—a medieval form of torture—by the regime. Twenty-eight months later, their goal remains elusive. The regime still stands. The doodles of Daraa, however, have unwittingly shaken a different, more expansive “regime” altogether: The century-old, European-created Middle Eastern political order. The wrath of the misnamed “Arab Spring” has exposed the sectarian nature of the region. Long-repressed identities have reemerged, challenging the unity of many Muslim states and blurring once-solid geopolitical lines. Until now, the post-Ottoman order, fashioned by wartime exigency, imperialist ambitions, and ignorance of local identities, has survived a century of independence, revolution, and war. A political map of the region from 1930 looks nearly identical to one from 2013. Middle Eastern borders have become an inviolable and sacrosanct principle of Western international relations. Americans and Europeans have even shed blood to ensure that these borders remain unchanged: in Lebanon in the 1950s and again in the 1980s, Iraq in 1991 and 2003, and Mali in 2013. Western intervention in Syria would likely have the same goal. Even as the ongoing Arab revolt tears at the modern Middle Eastern order, Washington, Paris, London, and Moscow remain committed to defending the status quo. 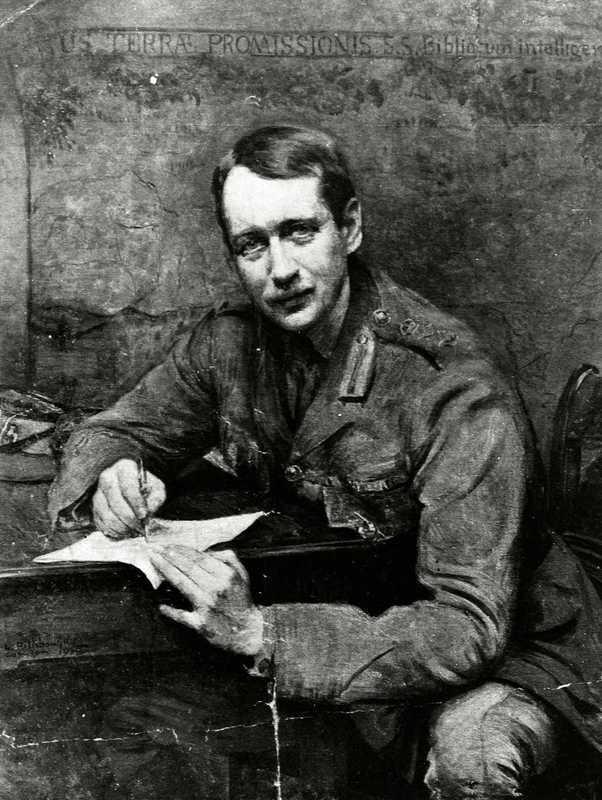 Leopold Pilichowski’s 1918 portrait of Sir Mark Sykes. Photo: Wikimedia. Rather than maintaining the artificial regime it imposed a century ago, Western nations, and Europe in particular, should look to their own geopolitical evolution for guidance. The history of modern Europe has been defined by the gradual emergence of nation-states out of the ashes of numerous multi-ethnic European empires. This process, and the resulting concept of self-determination, eventually led to the longest period of peace in Europe’s history. With this in mind, Europe and America should not stand in the way of the Balkanization of the Middle East. In the words of one veteran observer, “the myth of the strong and cohesive Arab state has been laid to rest.” The people do indeed want to bring down the regime. It is now time for outsiders to preach what they have practiced. Much as it did in Europe, World War I radically changed the political geography of the Middle East. The Ottoman Empire had long been the “Sick Man of Europe,” hemorrhaging territory for nearly a century. It lost control of its European possessions prior to the war and, having allied with the defeated Central Powers, lost its Middle Eastern territories afterward. The victorious Allies transformed the Middle East into its current form, with its European-designed names, flags, and borders. Ottoman provinces became Arab kingdoms, while Christian and Jewish enclaves were carved out in Lebanon and Palestine. Syria, Libya, and Palestine were given names resurrected from Roman antiquity. Libya reappeared in 1934, when the Italians combined Cyrenaica, Tripolitania, and Fezzan. The French mandate marked the first time “Syria” had been used as the name of a state, whereas “Palestine” was merely a Syrian appendage. Iraq had been a medieval province of the caliphate, whereas “Lebanon” referred to a mountain and “Jordan” to a river. 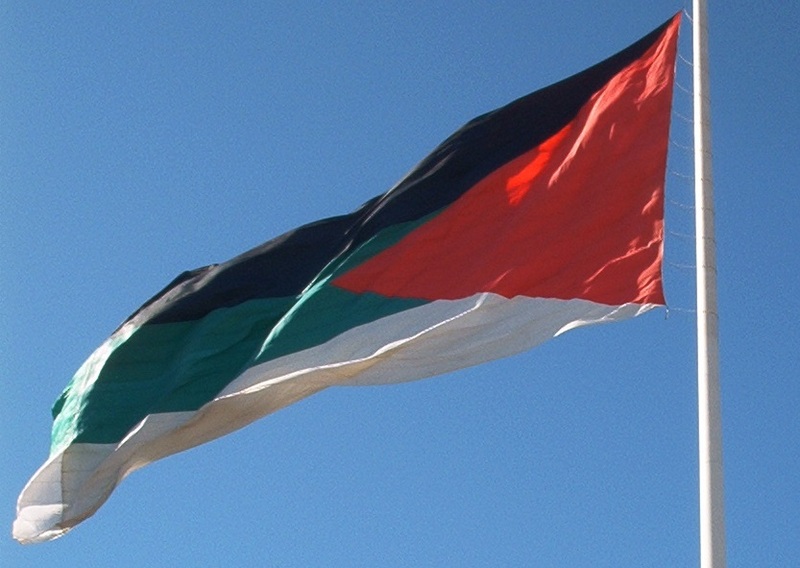 The new Arabic-speaking states adopted derivations of the flag of the Arab Revolt, which had been wholly designed by British diplomat Sir Mark Sykes. The four colors of the Arab flag—black, white, green, and red—represented the standards of different Arab dynasties: Abbasid, Umayyad, Fatimid, and Hashemite. They remain the colors of half of today’s Arab flags. Neither the names nor the symbols of the new states had any connection to their inhabitants. Even more problematic, the borders of the new states were determined neither by topography nor demography. 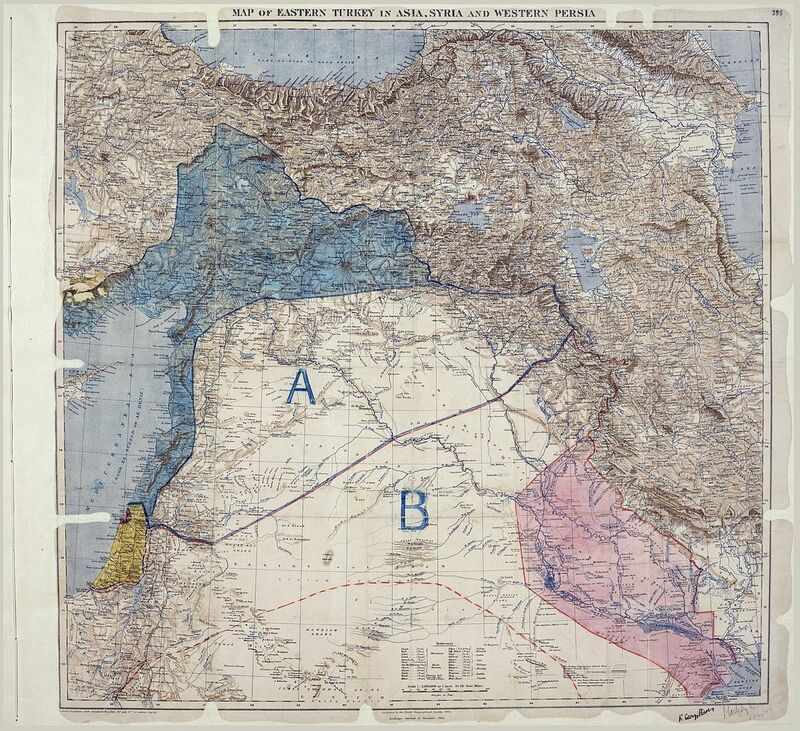 The infamous 1916 Sykes-Picot Agreement, the secret Franco-British-Russian pact that allocated regional zones of control, became the blueprint for today’s map, but Europeans had little interest in understanding the maze of Middle Eastern identities. A large Kurdish population—today numbering perhaps 25 million—was divided between four states: Turkey, Iran, Iraq, and Syria. Shiite Arabs were split between Iraq, Kuwait, Bahrain, and the eastern provinces of Saudi Arabia. The Alawites, a heterodox Shiite Arab sect, reside today along the northern Lebanese, Syrian, and southwestern Turkish coasts. The Druze were distributed between today’s Israel, Lebanon, and Syria. Lebanon, supposedly a Christian redoubt, included large Sunni and Shiite populations, as well as Alawites and Druze. Sunni Arabs, who formed the dominant population of the Middle East, were divided into numerous states. Pockets of Turkomen, Circassians, Assyrians, Yazidis, and Chaldeans were isolated throughout. At the dawn of the 21st century, minority ethnic groups ruled Iraq, Lebanon, Syria, and Bahrain, often repressively. The post-World War I settlement was extremely unstable. Coups were common, kingdoms overthrown, and by the 1960s, oppressive republics outnumbered monarchies. The early post-World War I settlement was extremely unstable. Coups were common, kingdoms were overthrown, and the French and British exercised a strong influence over local affairs. By the 1960s, Arab republics outnumbered Arab monarchies. Arab attempts to undo the partition of the region culminated in the merger of several states, such as Syria with Egypt and Iraq with Jordan, which itself annexed those parts of mandatory Palestine that were not ruled by Israel. The effort was short-lived. Repeated failures to excise the Zionist state from the Middle East marked the end of the endeavor. Arab leaders ultimately proved more interested in maintaining the fiefdoms they inherited from the Europeans than abdicating their cathedra for the greater Arab cause. Through it all, the old order remained in place. Neither independence nor Israel altered the imperial map. While the external borders remained unaltered, ethnic and religious strife was evident throughout. The creation of Greater Lebanon, turning a once Christian enclave into a multi-communal state, led to decades of discontent that ultimately became a full-blown civil war, killing over 100,000. In Iraq and Syria, strongmen from minority groups adopted Baathism, a secular nationalist ideology, in order to centralize power and subdue ethnic tensions, to little avail. Sunni uprisings against the Syrian Alawite regime in the 1980s and Shiite uprisings against an Iraqi Sunni regime in the 1990s were crushed. The Sykes-Picot order barely trembled. In a similar fashion, various efforts were made to forcefully marginalize or replace Kurdish identity. Syrian Kurds were notoriously stripped of their citizenship in 1962. Both Hafez al-Assad’s Syrian regime and Saddam Hussein’s Iraqi regime attempted to “Arabize” Kurdish areas by expelling local populations and supplanting them with Arabs from elsewhere. 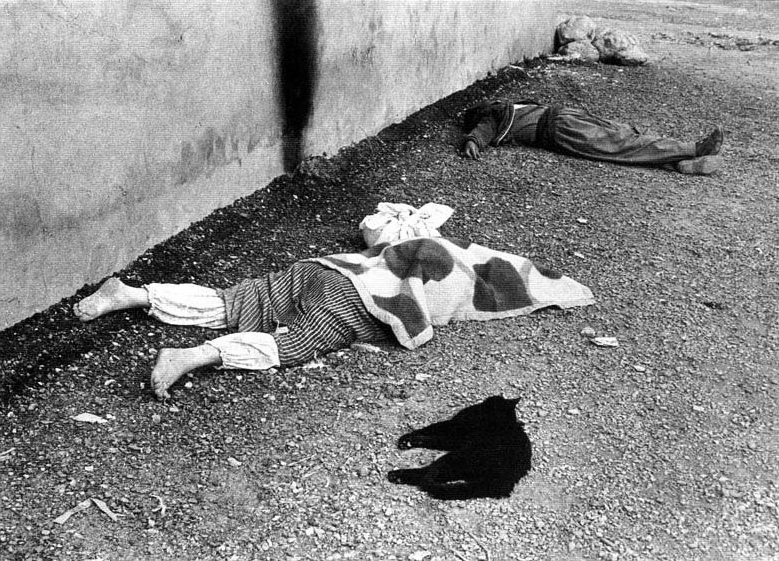 Saddam’s infamous use of chemical weapons to kill large Kurdish populations in Halabja in 1988 and the broader al-Anfal ethnic cleansing campaign are dark days in Kurdish history. In Turkey, the secular-nationalist ideology founded by Kemal Ataturk attempted to “Turkify” the country’s large population of Kurds, going so far as to completely deny their existence through the ubiquitous use of the term “Mountain Turks.” A Kurdish insurgency has sporadically raged across southeastern Turkey for several decades, with upwards of 50,000 casualties. Even after giving up direct regional control over the Middle East, external powers have repeatedly intervened in order to prevent ethnic violence from destabilizing the regional order. President Eisenhower ordered 15,000 U.S. soldiers into Lebanon in July 1958 after Maronite-Sunni clashes. In 1982, a multinational force again intervened to keep the parties separated. This time, the fighting also included the Jews (Israel) and Alawites (Syria). After the Gulf War, no-fly zones imposed in northern and, later, southern Iraq sought to protect the Kurds and Shia from Sunni Baathist attacks. French and U.S. forces are now in the process of rolling back a secessionist Tuareg state in northern Mali. Meanwhile, Washington flatly opposes Kurdish independence, criticizing strategic cooperation between Turkey and the Kurdish Regional Government (KRG) in northern Iraq, while supporting the central government in Baghdad. U.S. and European officials agree on keeping Syria intact, even if they disagree on how to do so. Whatever the consequences, Washington, Paris, and London have clung to the century-old order they created after World War I. Western reluctance to contemplate redrawing the map of the Middle East is understandable. Partition smacks of imperialism and war, arousing memories of India and Palestine in 1947, the numerous poorly-executed partitions of the Middle East, and the various Cold War divisions of Germany, Korea, and Vietnam. Moreover, inviolable political borders are the defining characteristic of the sovereign nation-state, the basis of international relations since the mid-17th century. Without sovereignty, the modern concept of citizenship or nationality is meaningless. Reciprocal behavior between nations is based on the mutual acknowledgement of each other’s sovereignty. Only in extraordinary circumstances, such as Kosovo, do states support unilateral partition. Violating the sanctity of sovereign borders sets disturbing precedents, which is why Kosovo remains unrecognized by states that have secessionist movements of their own, such as Spain, Russia, and China. If the Kosovars deserve self-determination, why don’t the Tibetans, Catalans, or Chechnyans? In order to maintain global stability, states shy away from changing borders, concerned that the redrawing may never end. Ironically, today’s Europe is the result of a century of partitions, secessions, and wars of self-determination. Europe too once consisted of multi-ethnic empires. The Ottomans once ruled southeast Europe, including Greece, the Balkans, Romania, and Bulgaria. Prior to World War I, the Russian Empire controlled eight modern European states. Norway achieved independence from Denmark and then Sweden only in 1905. Austria-Hungary was a conglomeration of various national groups and has given way to six independent nation-states. Nearly a century after its creation, the dissolution of Yugoslavia has resulted in seven Balkan nations. Meanwhile, Spain, the United Kingdom, and Belgium may look different in coming years as they grapple with Catalan, Scottish, and Flemish nationalism. Europe has become a continent of nation-states—fifty in all—making it a case-study in how squiggly borders can lead to greater peace and stability. With few exceptions, each European state now consists of a single people with a shared ethnicity, language, and religion. Why not in the Middle East? With few exceptions, each European state now consists of a single people with a shared ethnicity, language, and religion. The French speak French in France; Germans speak German in Germany. In contrast, the modern Middle East contains only four such entities—Iran, Saudi Arabia, Israel, and Turkey—and even these, as renowned Middle Eastern historian Bernard Lewis once wrote, have exceptions: “Iran” is a modern term, there is no word for “Arabia” in Arabic, and Israeli Arabs constitute nearly 20 percent of the Jewish state’s population. Turkey’s supposed ethnic homogeneity ignores its 15 million-strong Kurdish minority and was only achieved via the massacre of 1.5 million Armenians and the expulsion of 1.5 million Greeks—twenty percent of Turkey’s population at the time—in the aftermath of World War I. Applying the principles of self-determination to the Middle East has been contemplated, but never fully realized. President Wilson’s Fourteen Points included a specific reference to self-rule for the Ottoman Empire’s non-Turkish minorities. It was never implemented. After expelling the British-installed Hashemite ruler of Damascus in 1920, France created five separate Levantine states based on the old Ottoman vilayets (“provinces”): Greater Lebanon, an Alawite mountain state, a Druze mountain state, the State of Aleppo, and the State of Damascus. Concerned that a rising Germany was making inroads into its colonies, however, France acquiesced to a unified Syria in 1936, ending the short-lived experiment. Only Lebanon survived as an independent entity, and incorporated large, non-Christian populations over French objections. Similarly, the 1920 Treaty of Sevres, which ended the war between the Ottomans and the Allies, granted immediate independence to the Hijaz (the Saudi peninsula) and Ottoman Armenia—sometimes known as “Wilsonian Armenia” after the United States outlined its borders—as well as eventual statehood to Ottoman Kurdistan. These arrangements collapsed three years later, however, when Turkish forces smashed the Western-backed Greek and Armenian armies. A renegotiated settlement, the Treaty of Lausanne, ended the dreams of a Greater Kurdistan and Greater Armenia, setting the borders of modern Turkey. Like Europe once was, the map of the modern Middle East is potentially on the cusp of drastic changes. A renaissance in Kurdish nationalism, a result of the U.S.-led liberation—their word—of Iraq, threatens to dramatically redraw the boundaries of the Fertile Crescent. The KRG in northern Iraq issues its own visas, hoists its own flag, and speaks its own language. In return for greater official Turkish recognition of Kurdish identity, Kurdish insurgents have recently concluded a truce with Turkey. After first attempting to restore Kurdish citizenship after four decades, the Syrian regime has virtually abandoned the predominantly Kurdish northeast. As a result, Iraqi Kurds have vastly expanded relations with their Syrian brethren, accepting thousands of Kurdish refugees and openly training Syrian Kurdish fighters. The U.S-led overthrow of Saddam Hussein’s minority Sunni regime in Iraq was a pivotal moment in the modern Middle East. Majority Shiite rule returned to Baghdad for the first time since the 17th century, raising the hopes of beleaguered Shiite Arab populations in Kuwait, Bahrain, and eastern Saudi Arabia. Iraqi Shiite fighters are pouring into Syria to aid the Alawite regime. Meanwhile, after first violently resisting the change in power, Iraq’s newly dispossessed Sunnis have emulated the KRG, demanding greater autonomy from Baghdad. As Sunnis become invigorated by the Syrian rebellion and Baghdad’s continuing centralization of power, ethnic and religious violence has escalated. According to the UN, May was the deadliest month in Iraq since 2007. Indeed, the Arab uprising has unleashed ethno-religious nationalism across the Middle East. The Syrian civil war has spawned ethnic conflict in Lebanon and Iraq, reawakening fears of civil war in both countries. Ethnic cleansing in coastal Syria has led to talk of creating “Alawistan,” an Alawite enclave that could eventually stretch into northern Lebanon and Turkey’s Hatay province. Disaffected Sunni Arabs in western Iraq may join with their brethren in a rump Syria and northern Lebanon if the Syrian rebels prove victorious. A Druze enclave could emerge in southern Syria, containing the nearly one million Lebanese and Syrian Druze. Even in Egypt, Sunni-Shiite tensions are boiling. Ending the Sykes-Picot order does not mean unilaterally redrawing the map from Washington. Like the Balkanization of Europe, it would be a slow, steady process. While these changes could take decades to play out, new entities have already taken their first steps toward independence. In 2011, South Sudan seceded along ethno-religious lines, marking the first internationally recognized change in the borders of a Middle Eastern state in nearly 80 years. Meanwhile, the downfall of the Qaddafi regime threatens to devolve power to Libya’s former city-states and has reawakened a long-repressed Berber movement that spans much of the North African Sahara. A Moroccan government minister recently spoke Amazigh, the Berber language, for the first time in parliament. In April 2012, the National Movement for the Liberation of Azawad declared the independence of northern Mali, setting in motion a French-led intervention to roll back the secession and restore Malian sovereignty. Ending the Sykes-Picot order does not mean unilaterally redrawing the map of the Middle East from Washington. Events on the ground will drive these changes, whether they are caused by Kurdish nationalism, Alawite retreat, or Sunni Arab brotherhood. The emergence of a Kurdistan or Alawistan, or the shrinking of the Maronite enclave in Lebanon, could partition clashing nations and tamp down on long-running ethno-religious violence. Shiite Arab Baghdad, Sunni Arab Damascus, Maronite Beirut, Alawite Latakia, Kurdish Irbil, Jewish Jerusalem, Sunni Turkish Ankara, and Shiite Persian Tehran would still compete, but the lowered stakes could ultimately lead to a more stable and peaceful region. Like the Balkanization of Europe, such a process would be slow, coming in fits and starts. but its issue is the same: how diverse peoples are to regroup to create new political identities for themselves after the collapse of an ages-old imperial order to which they had grown accustomed. The Allies proposed a post-Ottoman design for the region in the early 1920s. The continuing question is whether the peoples of the region will accept it. Twenty years later, Fromkin’s question is in the process of being answered. The recent anti-government protests in the heart of the former Ottoman capital are centered on Taksim Square, which, ironically, means “division” or “partition.” The peoples of the region no longer accept the post-Ottoman system and their calls for self-determination echo those of European peoples over the last few centuries. As the children of Daraa wrote, the people want to bring down the regime. Perhaps we should heed their call.